Showing 21 articles from April 22, 2013. Centralia College Child and Family Studies is offering Parenting in Recovery on Tuesdays, April 30–June 18, from 5-7:30 p.m., at the Centralia College Campus in TEEN (LAX Building) on the corner of Walnut and Iron streets, across from the Centralia College gym. This 8-week class is for parents in substance abuse recovery, focusing on understanding the impact of substance abuse on family dynamics, rebuilding trusting relationships and renewing family bonds. Students will apply recovery principles to parenting while learning about their children’s developmental stages and age-appropriate expectations. A Friends of the Library program seems to be the next step for volunteers hoping to bring a Timberland Library to Toledo. Other libraries within the Timberland Library District have Friends groups, which act as fundraising entities helping to coordinate and promote library programs. They can also help generate support for the ballot measures necessary to join the library district, according to Jeff Kleingartner, communications manager for Timberland. Everyone hopes for pleasant weather this weekend for the Garage Sales, but “The Sales” will go on, rain or shine. The Women’s Club Sale at Pioneer Hall promises a fine selection and I’m adding addresses daily to the Sale Map. Call me to add yours, and I’ll cruise the alleys before printing them. Copies will be on the Café, Library and Pioneer Hall porches. Don’t forget that the VFW will serve hot dogs with all the trimmings both days at Community Hall. On December 12, 1838, Father Blanchet took Augustine Rochon, the only personal servant that had been allowed him, and set out in a canoe with four Indian paddlers. They floated down the river to the mouth of the swift Cowlitz River, and then went up this stream until they reached Cowlitz Prairie. Here were located the Hudson Bay Company’s extensive farms managed by Simon Plamondon, assisted by five farmers. Shopping for local eggs last week, I stopped in and met The Teds, got history, a source for plant starts plus a short course on arrowheads and ancient commerce. And fresh eggs, of course. On Jackson Hwy North of milepost 13. New Life Church invites you to dinner Wednesday nights 5:10-6 p.m. Menu items change each week. Donations accepted, not required. Call (360) 864-4366. It’s getting close to that time of the year again. Yup! The Winlock’s 77th Egg Day is just two short months away, scheduled for June 21 through 23. This year, the theme is “The Great Eggscape”. If you’re interested in being a vendor during the celebration, you can pick up an application at City Hall or print one off their website at www.winlockwa.govoffice2.com. The applications are due by June 14. 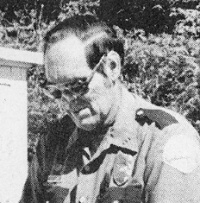 Clyde Grover Connolly, 84, died April 11, 2013. Born Nov. 11, 1928, he was 84. He was preceded in death by parents John and Mary Connolly, brother John Edward Connolly, sister Beatrice and sons Kevin Connolly and Charles Connolly. He is survived by wife Ester Connolly, sons Mike, Robert and Steven, daughter Colleen, brother Heaber, grandchildren Aaron McKinsey, Stefeny Connolly, Sondra Connolly, Erica Page, Marcus Page and Christopher Connolly, and great-grandchildren Jordan McKenzie, Josiah Page and Comhena Lee. Merel “Mike” Mulligan, of Mossyrock, Died April 17, 2013. Born April 3, 1930, he was 83 years old. He is survived by wife Venita Mulligan. The ongoing lawsuit against the Ryderwood Improvement and Service Association (RISA) has reached a crucial turning point, as the defendants have asked the court to separate the issues of whether or not they violated the plaintiff’s rights and whether or not the plaintiffs are due compensation. The suit had been brought in 2009 as a class action led by Raymond and Deborah Balvage, of Longview, and Charles and Susan Weaver, of Kelso, in response to the discriminatory housing practices of RISA under the Housing for Older Persons Amendment (HOPA) of the Fair Housing Act (FHA). HOPA allows discriminatory housing in recognized communities where 80 percent of households have at least one resident 55 years old or older in order to maintain status as a retirement community. An executive session to determine the legitimacy of a water moratorium on Vader will be rescheduled due to the unavailability of Lewis County Public Works Director Tim Elsea during the City Council’s April 16 meeting. Mayor Ken Smith shared during the previous meeting Elsea had told him there was no moratorium against Vader, though Smith said he remembers hand-delivering a copy of Resolution 2009-19 to Elsea when articulating the existence of a county-imposed moratorium four years ago. Elsea reportedly expressed his intention to attend the next meeting May 7. Toledo/Winlock Baseball is moving into the final stages of fundraising for a 36" x 72" batting cage as part of the Toledo High School athletic facilities. Over the weekend, volunteers broke ground and laid down rock to begin the process. "We are the only school in the area without a batting cage," said Nate Vermilyea, a long-time volunteer in Toledo baseball circles. "There is a lot of excitement to get this in place." After winning five games in a row, Toledo/Winlock United soccer had to face the number one and two teams in the 1A Trico League and endured 2-0 and 6-2 losses to Columbia (of White Salmon) and Seton Catholic, respectively. On Thursday, however, United bounced back in dramatic style with a come-from-behind victory over King's Way Christian. The Knights jumped to a 2-0 lead, but T/W scored two late goals to even the game and then Jacob Andrews scored the winning goal in the final minute of regulation play. Cadets with the 2013 Police Reserve Academy spent Saturday and Sunday at the Cowlitz Gun Club, in Winlock, practicing the fundamentals of safe and effective marksmanship. 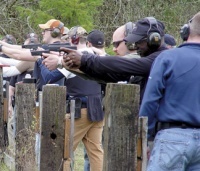 Part of their ongoing curriculum, cadets were made to practice maneuvers such as clearing a misfire, speed reloading, and quick draws, all of which have a strong bearing on their effectiveness as future members of law enforcement. A Winlock man has was arrested Friday after making deadly threats against his ex-girlfriend, according to the Lewis County Sheriff’s Office. Ross C. Lawrence, 27, was arrested after his 24-year-old ex-girlfriend called to report he had left her threatening voicemails stating he was going to murder her and covertly dispose of her body. She told investigators she and Lawrence had just broken up after a five-year relationship. Fire districts based in Winlock and Vader have submitted letters of intent to withdraw their participation from Lewis County Medic-One in light of what they claim has been budgetary mismanagement and poor financial oversight. Formed by an inter-local agreement between District 15 (Winlock) and District 2 (Toledo) in 1993, and later joined by District 20 (Vader/Ryderwood) in 1997, Medic-One has been providing paramedic and medical transportation services to South Lewis County on a largely self-sustaining business model until recent years. A firm date of May 6 has been set to deliver medals of honor from Lewis County Fire District 15 to Newtown, Conn., to honor the educators who were slain during the attack at Sandy Hook Elementary School Dec. 14. 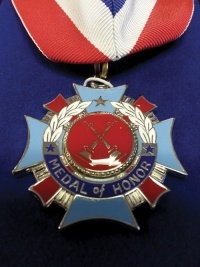 Seven medals were struck individually and are now in the possession of the fire district; one each for the families of teacher’s aide Rachel D’Avino, 29; prinicipal Dawn Hochsprung, 47; teacher’s aide Anne Marie Murphy, 52; teacher Lauren Rousseau, 30; school psychologist Mary Sherlach, 56; and teacher Victoria Leigh Soto, 27; and one to be framed and given to the school for display. Officials and officers commemorated the life of former Toledo Police Chief Bert Morey during the April 15 Toledo City Council meeting. Morey, who was 80 years old, had been found dead in his Toledo home April 11 of a heart attack and, in light of the community’s loss, city leaders issued a proclamation during the meeting honoring Morey’s contributions to the city. A fifth-wheel trailer was declared a total loss after firefighters responded to a blaze on the 200 block of N. Military Rd. in Winlock tonight, according to Lewis County Fire District 2. 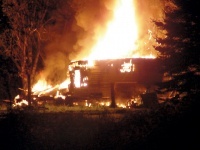 District Chief Grant Wiltbank said the call came out at around 9:30 p.m. and was originally described as a structure fire, prompting mobilization of all available volunteers in the Winlock, Napavine, Toledo and Vader areas. SR 505 was temporarily closed to accommodate the large emergency response, with firefighters able to quickly bring the blaze under control. Michelle L. Price, 31, of Toledo, is wanted by Lewis County District Court on a $5,100 warrant after failing to appear for on charge of assault/domestic violence. 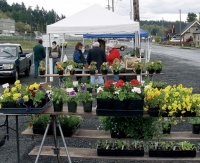 Vendors were out for the first day of the Winlock Farmer's Market Wednesday. To order your own booth between now and the end of September, call (360) 785-4817. Getting ready for remodeling season? Try Westley Interiors in Centralia, a new interior construction company that combines quality work with quality customer service. 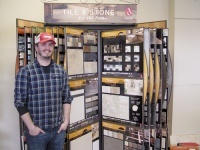 Owner Josh Westley said his services are available for everyone from experienced do-it-yourselfers to novice homeowners, adding his local staff of remodelers and sales representatives will provide personal, knowledgeable service.